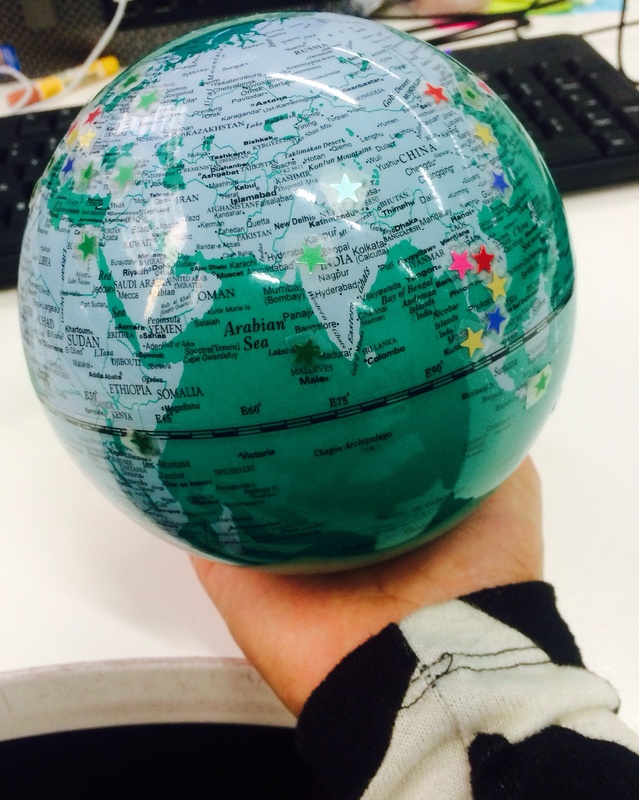 Meet the world, my coin bank which was given to me as a bday present by Fi some years ago. The world is hungry so I feed it. It has a strict diet of gold coins, only the $2 ones. Feeding time is anytime. The more frequent the feeding, the better. The world is vulnerable so I raid it. Most common time of attack would be in the morning, when I don’t have money for the coffee run. The world gives when the time is right. And it gives a lot. At first, it was enough to buy me a bike. Today, it was for my pocket money for my holiday in Manila next weekend. The world lives and waits to be fed. The cycle continues. Day 81 – Bought a pair of Melissa wedge shoes, yes, the plastic ones. Though I felt Minnie Mouse-y, I think the shoes had the cuteness factor just fine. Day 80 – Today A and I bought an iron — our first small appliance hahaha! I survived for 3 years without one and A just had to get one since his iron’s useful life has ended. 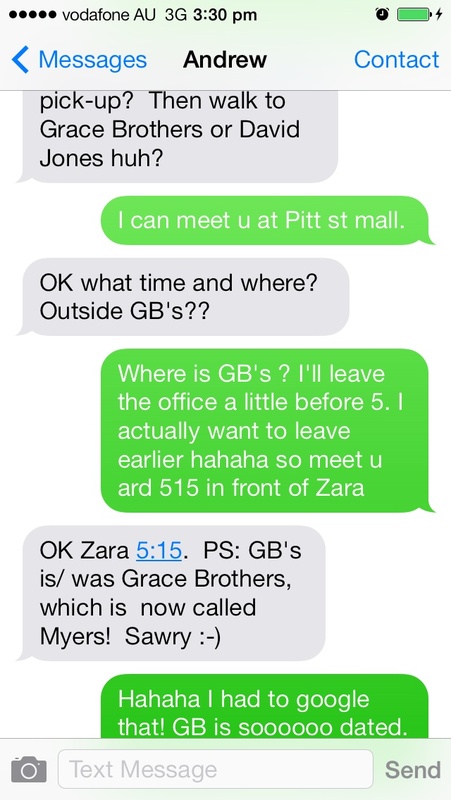 I didn’t know Myer used to be Grace Bros. — you learn something new everyday! Day 79 – I walked to work, walked with Dj at lunch, walked home and went on an evening walk with A. That ought to meet the daily quota of 10000 steps a day to keep fit! Day 78 – I attended a breakfast forum today and while it was a struggle to get up early, what I learned made it worth it. Networking was the topic and the speaker shared four key points about it. No, I will not write about the four points, just the bit that I found most interesting — the technical definition of personal space. Imagine a half cylinder around you, 33 cms to to your side and 45 cm in front which is the apex of your space. It is in this apex that you gesture like holding a paper clip when trying to emphasize a point. So there, 33 cms to your side 🙂 if someone stands closer, that’s too close hahaha! Day 77 – I made two long distance calls today : one to our housekeeper in Manila and the other to one of my college friends. The former was more of a pre-trip check to ensure that everything was ready for my trip home in June. I am soooo looking forward to going home and not worrying about cooking or cleaning up! The call to Boops was my way of making up for all the years when I greeted her late on her birthday. We had a long chat and as you know, nothing beats talking to friends like it was just yesterday when you last saw each other. Day 76 – With 3 lamb dishes in the fridge, I was on the way to lamb burnout. A random decision to eat out tonight was the best preventive action. A and I picked this new-ish gyoza place and apart from the food, I loved that they had Japanese toilets … The fancy ones with the buttons !